Hunter Douglas offers state-of-the-art window treatment motorization with their PowerView® system. There is simply no better made, more convenient, more robust or attractive motorization systems for blinds and shades. This system can be installed on virtually every window shade or blind manufactured by Hunter Douglas. Which means that whatever your décor or design style, there is a motorized window treatment that’s right for you. The PowerView® Motorization system won the coveted 2016 Red Dot Design Award, as well as the 2015 Best Interior design Product of the year. It is truly a stunning product. 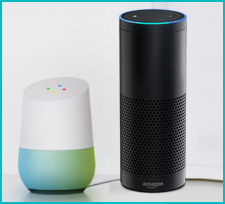 • Via “Smart Home” Systems such as Amazon Echo (Alexa), Google Home Assistant, Nest & many more. You can open or close the blinds individually or all at once – adjusting height, tilt, etc. – but that is just the beginning! You can program PowerView to move your window treatments to the exact position(s) you want “automatically” according to any schedule that you set during the day or night – even when you are not home. You can even schedule your window treatments to automatically open and close according to your location’s changing sunrise or sunset times—which are precisely calculated by PowerView based on its knowledge of your specific location. If you are an Amazon Echo (Alexa) Google Home Assistant user, you can also control your PowerView window treatments with voice commands. Depending upon the Smart Home system you use, your blinds and shades can even integrate with your thermostat to open or close your shades as the temperature in the room rises or drops. Or, you can coordinate your shades or blind with your lighting – to turn on lights and when you close the shades, or turn off lights when you open them! The cost of adding motorization to Hunter Douglas Blinds and Shades is remarkably affordable. In fact, in most instances, motorization only adds about 10% to the cost of the custom blinds or shades. This is truly a small price for the utmost in convenience! And, because automated motorized shades typically control indoor room temperatures better, the energy savings alone usually more than pay for the small initial investment. In addition to being more convenient, the cordless operation of PowerView means no unsightly cords – making them more attractive. And, more importantly, cordless operation creates a safer environment for homes with young children, visiting grandchildren and/or pets. Most PowerView motorized window treatments are battery-powered, so they can be installed installed anywhere – even in areas without an outlet, such as a skylight! And because they are battery operated, they function even in the event of a power outage. A small battery pack is completely hidden behind the headrail – so nothing detracts from the beauty of your window treatments. We are a licensed Hunter Douglas dealer and we have designed and installed many custom PowerView® motorized blinds and shades in Calabasas, Malibu, Agoura, Westlake Village and Ventura County homes. If you are ready to take your home to the next level – with the state-of-the-art elegance and convenience of motorized blinds and drapes – call our experts today. Click Here to set up an appointment with us for a free, in-home consultation with one of our designers. Or, call us today to discuss motorization options for your home: 818-597-0440. Hunter Douglas Motorized Blinds & Shades Let You Enjoy Malibu’s Ocean Views, Calabasas’ Canyons, Thousand Oaks Beautiful Trees or Westlake’s Mountain Vistas, With the Touch of a Button!